Several years ago the Lord placed it in my heart to love my enemies. At the time I thought , “But Lord, I have no enemies.” Non the less I started to pray. In this day and age not many people love their enemies. I’m not even sure if there was ever a time when they did. I had no idea until recently what it truly meant to love ones enemy. 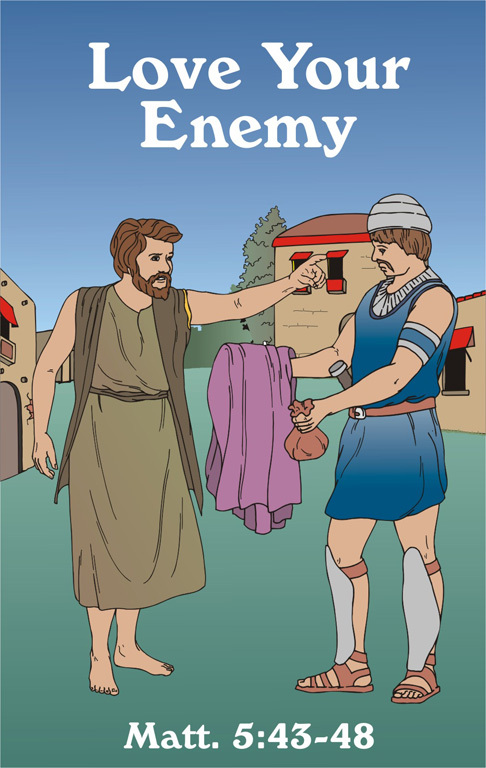 Also, what makes someone an enemy, exactly? My guess might be, someone who does you wrong. Someone vindictive perhaps. Someone hurtful. Someone who bad mouths you. Someone placing plans in action to hurt, and crush you. Perhaps even take over your life. If the average person had someone do any of these things to them, the instant reaction would be… to crush them right back! Maybe even double the blow! Afterall, who do they think they are! We may start off feeling mad and angry when someone does something to us out of jealousy,envy or hate. Personally, I think the first two, cause the third. >HATE! You meet someone who seems to have the perfect life to you. If you feel that, that person takes their life for granted. Whether it’s true of not you may start to become jealous, and envious of that person. Which in return, secretly form a hidden hate towards them. Maybe you won’t realise it at the time, or maybe you do. This causes you to slowing start dropping subtle hints… How great they have it… How lucky they are. How their life seems so much easier and more fun then your life. Etc. Immature in many ways, yet true. Satan will happily keep them in the dark too. Their heart will go out more and more … Not knowing that you are planning an attack. What goes around comes around. And the Lord will not let the righteousness fall before victory prevails. When the Lord opens your eyes to certain things around you, that is when the pieces from months past will began making sense. Where does Loving your Enemies come into place? Do you chastise the one who is out to get you? Do you lovingly rebuke them? Is THAT even possible to actually acomplish? You decide (through Christs love) that is it best to pray, and pray some more. The Lord reminds you of Paul and Silas who were thrown into prison, yet were singing praises to the Lord the whole time…NOT planning their revenge on those who placed them there. You feel confused…Perhaps even upset at yourself for not being angry and wanting to seek revenge..
THAT is when it hits you! Praise be it to GOD! It is possible to Love your Enemies! You have it in you to love those who hate you. Love those who do wrong to you! And it is not hard at all. Nothing like you thought it would be…. Because you have been praying for years To Love your Enemies, not realising that you had any…. The Lord has a plan. He always does and always has. You may not have all the pieces of your life right now. You may be questioning a whole lot of things that are going on with your life. But the Lord already has all the details taken care of. He has YOUR best intrest at heart! All you need to do is sit back and trust him. Once you lay it all at the cross, and truly surrender your life to Christ..I assure you..YOU will not worry about tomorrow. Tomorrow is already taken care of. You don’t even have to stress, get mad, angry or sad. Not even depressed! You have everything you need right now! Let go and let God….